Happy New Year! 2017 was a pretty busy year for me, mostly because I got my own place! Moving out of my parents house for the first time was a big step for me but I’m proud of how well I’ve managed. If anything, life is much simpler! And quieter.. I love how peaceful my new home is despite it being in a more central location and my parents house was in a sleepy village. I’ve already shared with you my bedroom and kitchen room tours, so this is the dining room edition! 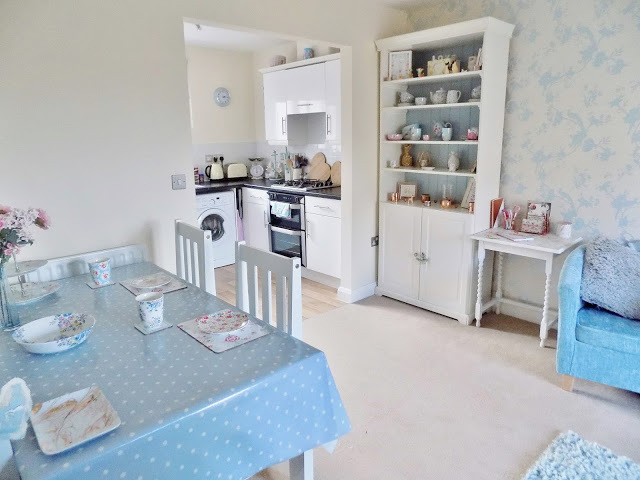 I say dining room, it’s not actually a separate room, more of a dining ‘area’ on one side of the living room next to the kitchen. After spending a ridiculous amount of money on solicitors fees which were much more than I was expecting, I was pretty skint. I wasn’t able to goand buy loads of brand new furniture, but I was lucky to find all my stuff almost new on local selling groups and eBay. 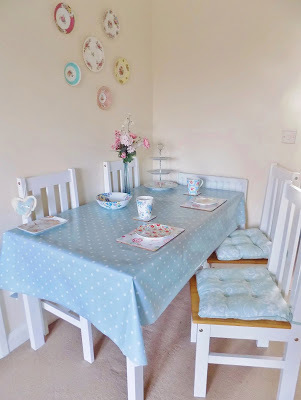 I bought this large pine topped dining room table which came with six chairs for only £50 from a Facebook group! Also it just so happened to be less than a mile down the road from me, so it was ideal and just what I needed. It fits just perfectly in the ‘dining room’ corner and is more than big enough for the two of us, and we can pull it out if we need to seat any more. I was also quite lucky that I had been collecting and saving bits and bobs for my first home for years. 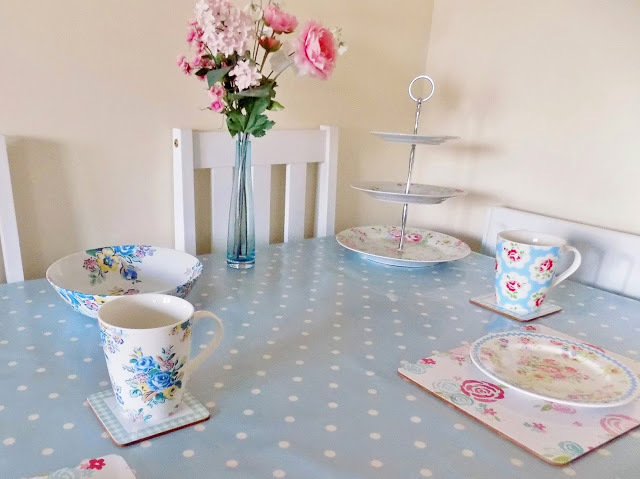 By the time I moved in I had absolutely tonnes of plates and mugs etc, so at least I didn’t have to go out spending loads of money on it all! 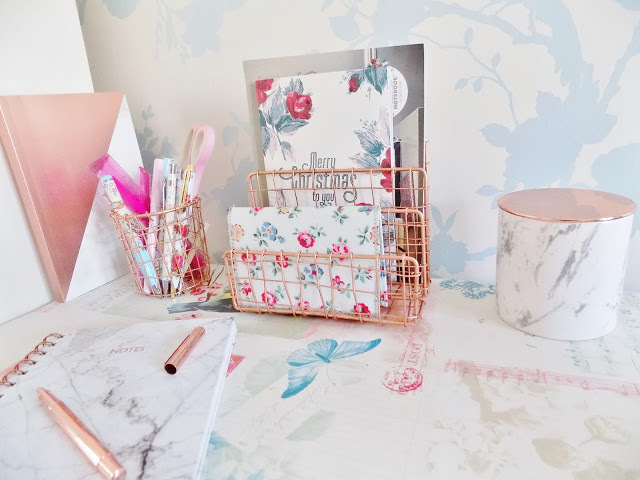 A lot of my pieces are from Cath Kidston that I’ve bought over the years in the sale or from the Cath Kidston Factory Shop in St Neots. 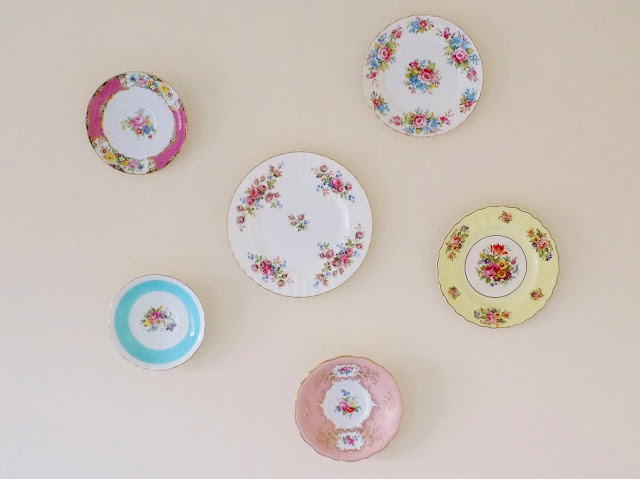 One of my favourite features in the whole flat is my vintage plate wall! 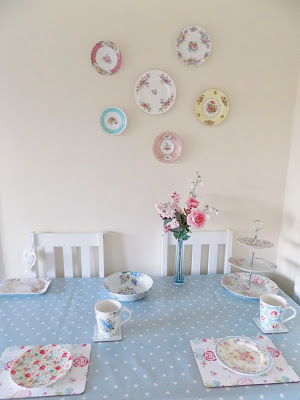 Much to my boyfriends dismay, I was very insistent on putting some of my favourite colourful floral plates up as the perfect way to display my collection. I simply used some UHU glue to secure paperclips onto the back of the plates so that they could hang on a nail in the wall. They’ve been up for weeks now successfully without falling down, and I’m in love! Since I took these photos I’ve also added another plate on.. oops! 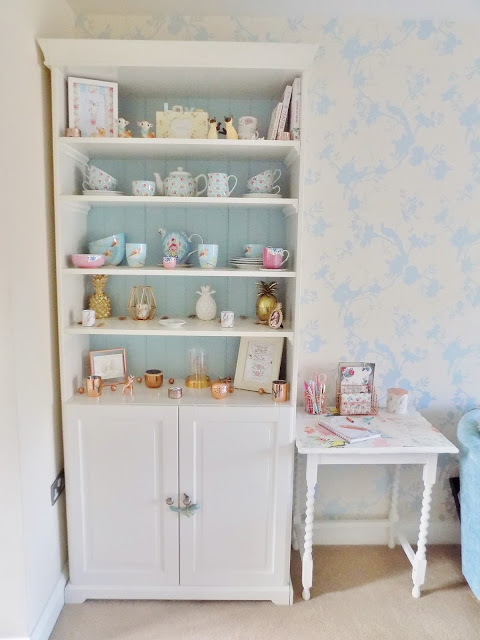 On the other side of the dining area I have my beautiful large storage cupboard. I managed to buy this on eBay for only £25 which has an original retail price in Ikea of over £200! 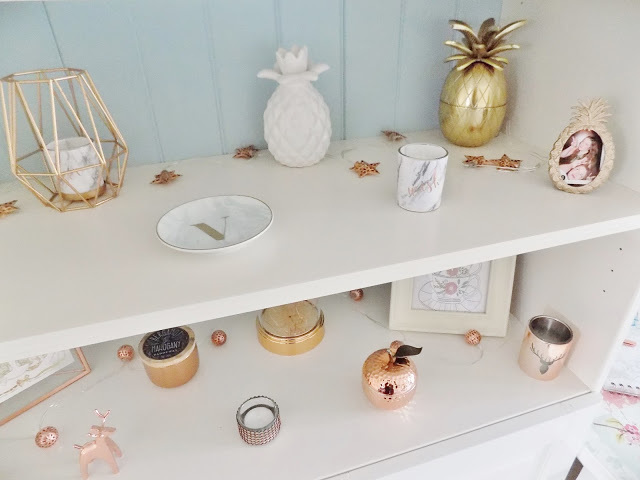 In it I keep all my pretty trinkets (I finally have somewhere to keep my Cath Kidston and Pip Studio tea sets! 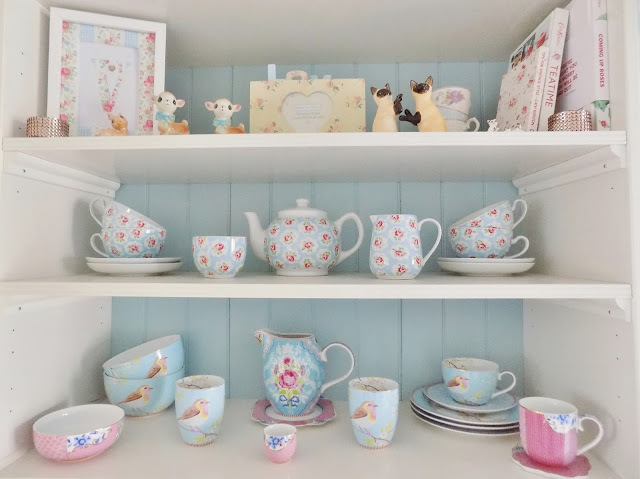 ), and the cupboard part is very useful for storing extra bits and pieces. I also painted the back board duck egg blue so it matches the rest of the room and I love how it turned out! 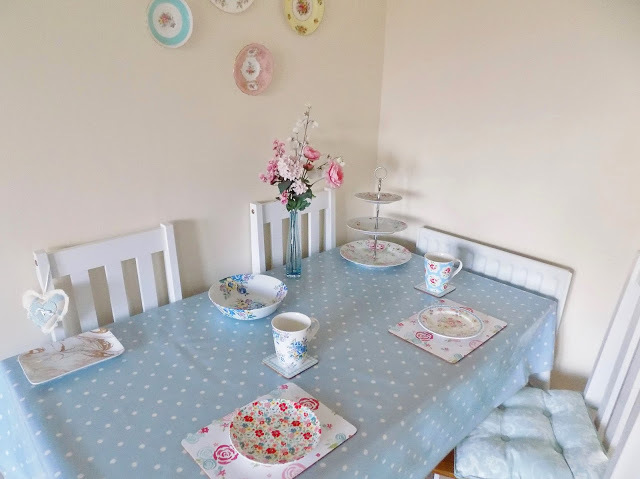 Next to the cupboard I have this little table which I upcycled a few years ago by painting white and covering with some pretty printed wallpaper. 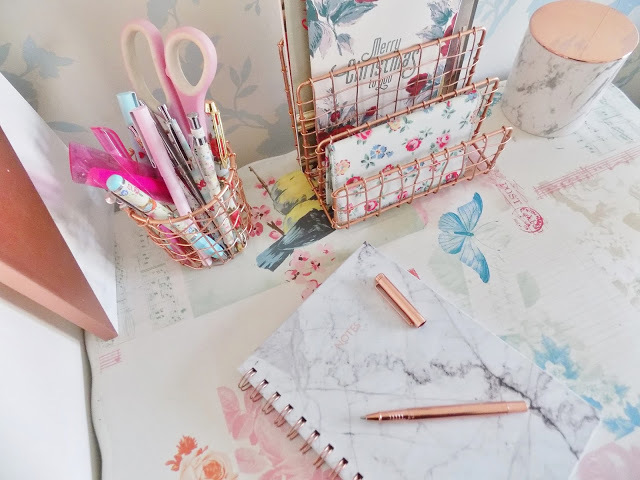 I’ve decided to use it as a little desk area so it’s been kitted out with a few copper stationery accessories including this wire pencil cup and matching letter holder from Cabo at Red Candy. 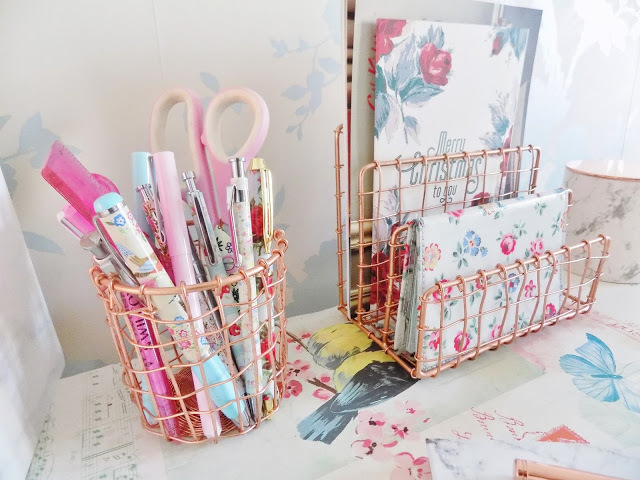 The letter rack is so useful to store all of my letters/bills etc that I don’t want to lose! I hope you enjoyed my dining room tour.. next up.. living room! Your dining area looks so lovely. I love these posts on your new place, looking forward to the next one. It is beautiful!! 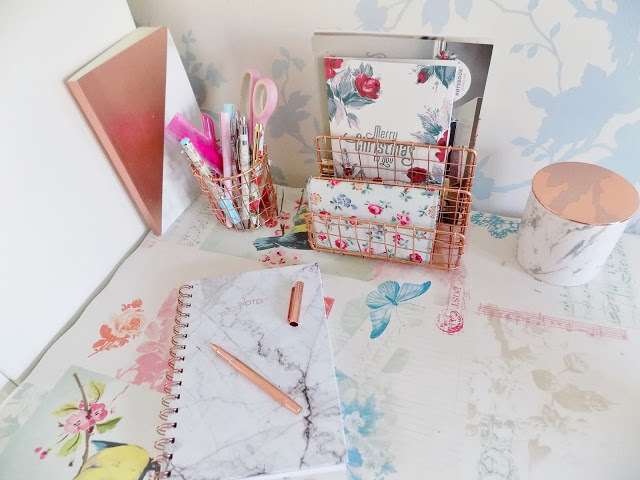 I love how you've styled it and I've just seen your post on St Neots cath kidston store! I think I'll be taking my mum there, she'd love it! I can't believe you got so much of this second hand it all looks so new and fresh!